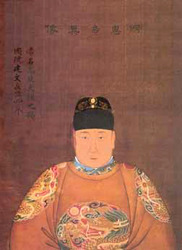 The Jianwen Emperor (Traditional Chinese: 建文; Simplified Chinese: 建文; pinyin: Jiànwén; Wade-Giles: Chien-wen) (5 December 1377–13 July 1402), with the personal name Zhu Yunwen, reigned as the second Emperor of the Ming dynasty. His reign Jianwen name means "Establishment of civil virtue". The Jianwen reign was short (1398–1402). After he assumed the throne, Jianwen Emperor began to suppress feudal lords, which included his uncle Zhu Di. Feeling threatened, in 1399 Zhu Di raised an army and began to march toward Nanjing from his northern base in Beijing under the banner of the Jingnan campaign. In 1402, Zhu Di's army finally reached Nanjing and, after a brief fight, Zhu Di usurped Jianwen Emperor's throne and was crowned as Yongle Emperor. When, Zhu Biao, the first son of the founder of the Ming dynasty, Zhu Yuanzhang, died on May 17, 1392, Zhu as his successor chose Zhu Biao's then 15 year old (second) son, Zhu Yunwen (born December 5, 1377). Zhu Yunwen ascended the dragon throne 21 years old on June 30 1398 upon the death of his grandfather. But he was only to rule for a mere four years as 2nd Ming emperor Huidi with reign title of Jianwen ("Establishing Civil Virtue"). The Ming empire was at that time divided into areas, each commanded by a Ming prince. Jianwen contrived with his trusted ministers Qi Tai and Huang Zicheng to weaken or eliminate the other princes. Throughout 1398 they managed to kill or imprison the Princes of Qi, Dai, Zhou and Xiang. But when it was time to take on his uncle, Prince of Yan and commander of the tough northern frontier army, they soon learned that he was in no mood to let himself be brushed aside. When envoys were sent north to arrest him, he rose up in rebellion starting a bitter civil war that was to last almost four years. The empire had a numerically far superior army and the Prince of Yan went into each battle knowing that this could well be his last. But the prince's army mainly consisted of cavalry so he was less dependent on supply lines and by bypassing strongholds, which his cavalry was ill equipped to storm and conquer, he eventually arrived with his armies at the gates of the capital, Nanjing. The capital fell on July 13 when key imperial officials betrayed the empire and opened Nanjing's Qinchuan city gate letting in Prince Yan's troops.